Looking for a cheap ticket to Copenhagen? Here you can search all major low-cost airlines for cheap flights to Copenhagen Airport, Kastrup (CPH). The Copenhagen Airport, Kastrup is located 10km from the Copenhagen city center. A taxi from Copenhagen Airport, Kastrup to Copenhagen center would cost DKR 300. Before you book a flight you can use Utiket to find the cheapest flights to Copenhagen for Lufthansa (LH), SAS Scandinavian Airlines (SK), British Airways (BA), Air France (AF), Icelandair (FI). All flight data are real-time and accurate. 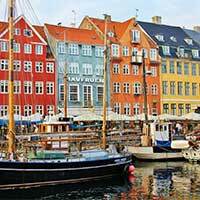 Follow the links to search and book your cheap ticket to Copenhagen directly with the airline or one of our partnering travel agents. Copenhagen Airport, Kastrup or sometimes called Copenhangen Kastrup Airport as well, is the main international airport of Denmark, serving the capital Copenhagen, the Zealand island and, since the opening of the Oresond Bridge in 2001, a large part of Sweden as well. Copenhagen Kastrup Airport is one of the oldest civil airports in the world and is with well over 20 million passengers a year by far the most busiest airport in Scandinavia. Copenhagen Airport is one of the main hubs for SAS (Scandinavian Airlines) and the main base for Norwegian Air Shuttle. Read more about Copenhagen Airport, Kastrup. This is a list of all airlines flying to and from Copenhagen and how many flights and destinations they serve. You can see a complete list of airlines and flight options to Copenhagen. Need place to stay in Copenhagen?